Patient selection for cholecystectomy based on oral fatty meal augmented cholescintigraphy in cases with chronic acalculous biliary pain: Is it really that reliable? S. Rao BS, Menezes LT, Rao AD, John SK. 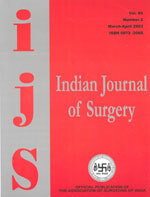 The intra-operative use of mobile phones; Why is there a controversy?